At 92, Bob Ervin is a gentleman who genuinely appreciates a job well done. 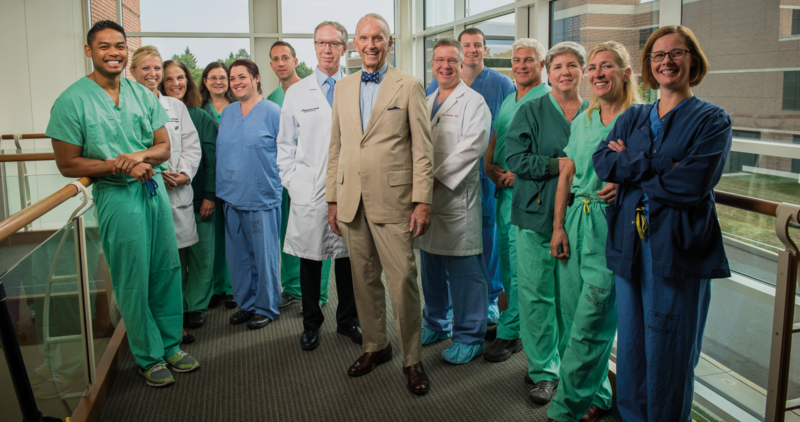 After undergoing Transcatheter Aortic Valve Replacement (TAVR) at Doylestown Health’s Richard A. Reif Heart Institute, he recognized the people and organization who cared for him so well. Fans of the TV series “Mad Men” are familiar with the heyday of the advertising business. Bob Ervin lived it as an executive with N.W. Ayer, a worldwide ad agency headquartered in Manhattan. His career taught him the power of communication and the value of strategic partnerships. Later in life, as a trustee for hospitals and healthcare organizations, he applied this knowledge to advance quality healthcare. When he learned that he would need TAVR surgery, Bob leveraged his past life experiences to find the best hospital and doctors to perform this critical procedure. That search led him to Doylestown Hospital and the cardiac specialists at the Richard A. Reif Heart Institute. A minimally invasive procedure, TAVR replaces the aortic heart valve through the use of a catheter and stent, eliminating the need for open-heart surgery. TAVR is accomplished by a highly trained team of cardiothoracic surgeons, interventional cardiologists, radiologists, cardiologists, nurses, and rehabilitation professionals. TAVR also requires specially designed facilities and equipment. TAVR is generally available only at large university or specialty hospitals, where Bob initially planned to have his surgery. However, after attending a heart valve disease information session led by James McClurken, MD, FACS, a nationally recognized cardiothoracic surgeon practicing at the Heart Institute, Bob reconsidered. “When I heard Dr. McClurken speak, I was so impressed. He did a beautiful job with his presentation. I wanted to know more and made an appointment.” Bob later met with a team of Heart Institute surgeons and cardiologists. “I found the doctors and the experience very different from other hospitals,” said Bob. “They were so easy to talk to, listened well, were friendly and very professional and competent. I gained a lot of confidence.” Bob also discovered the hospital’s distinguished national ranking and clinical outcomes for TAVR. “That was good enough for me,” he said. As Bob acknowledged in one of his letters, “How fortunate I am to have chosen the Heart Institute for my TAVR procedure.” Ask anyone on Bob’s care team and they would say the feeling is mutual.